The INTRUST Bank Arena is Wichita's state-of-the-art sports and entertainment venue located downtown Wichita. Owned by Sedgwick County and managed by the world-leader in venue management, SMG. Visit the official INTRUST Bank Arena web site at: www.intrustbankarena.com. Opened in 2010, The INTRUST Bank Arena features 22 suites, 40 loge boxes, 300 premium seats with a total 15,000-seat capacity. The arena boasts industry leading acoustics and sound system. More than 4,000 parking spaces within a 4-block radius. Guests can dine on wide variety of food and drinks from 16 concession stands, including Papa John’s Pizza, Carlos O’Kelley’s Mexican Restaurant, BBQ, traditional selections like hot dogs, grilled chicken, popcorn, french fries, soft drinks, water and alcoholic beverages. 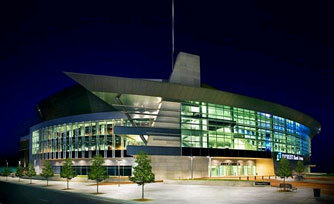 INTRUST Bank Arena is the ideal setting for Wichita concerts, sporting events, motor sports, theatrical events and more. The Box Office at INTRUST Bank Arena is located on the southwest side of the building off of Waterman and Emporia Street. The Box Office accepts cash, Visa, MasterCard, American Express and Discover cards. INTRUST Bank Arena is supported by 4000 officially-designated parking spaces in city-owned or city-managed private lots. The Q-Line trolley also offers free shuttle service to lots, as well as restaurants, bars, hotels and performance venues throughout downtown. For more info on Arena parking visit parkdowntown.org.